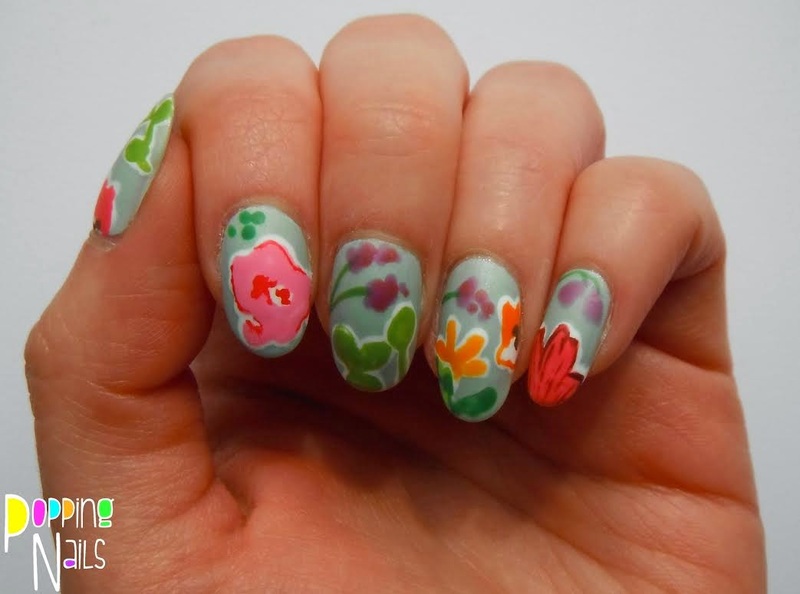 Hey everyone - a while ago I guest posted on Popping nails, a post which you can see here. Today she's returning the favour - thanks so much Charlie! 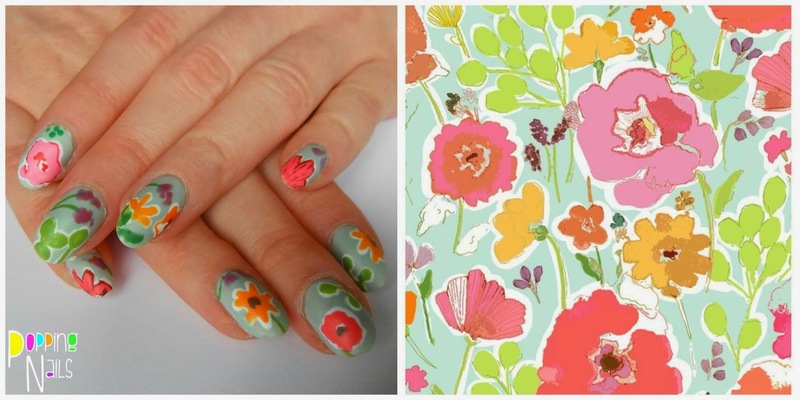 Love your nail art! Firstly I'll introduce myself, I'm Charlie from the blog Popping Nails and I'm so excited to be a guest post for Jessie. I've been a fan of her work since I started nail art so I hope everyone likes my style and what I've done for today! For this design I found the inspiration a while ago and forgot about it so it was nice to go back to it and try it out. For my base colour I used China Glaze Keep Calm, Paint On. To start with I took Sinful Colors Snow Me White and put in the basic shapes for all the flowers and leaves. I then took Barry M Key Lime and painted in the round leaves and stems. 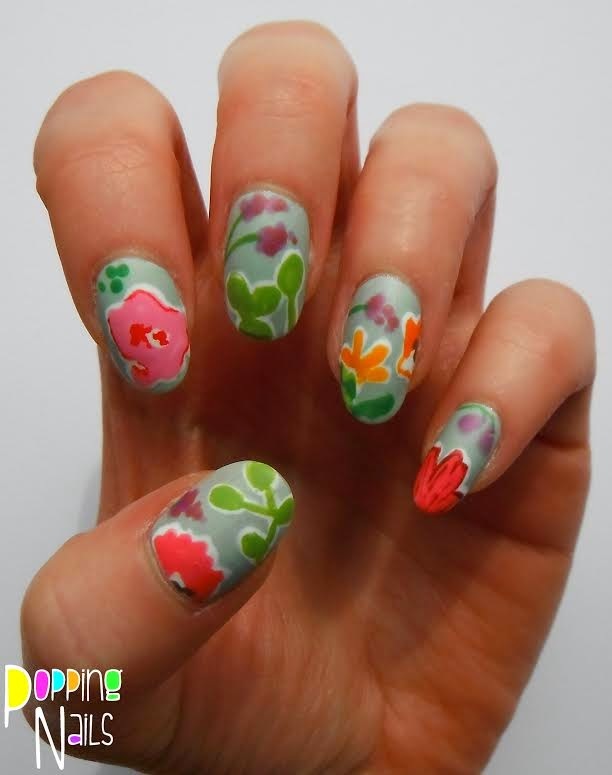 For the flowers on my thumb and little finger I used Barry M Pink Flamingo and on my index finger Bright Pink and Passion Fruit. The orange flowers on my ring finger are done with Barry M Mango with the lighter one being mixed with Yellow. Finally the darker leaves are done with Barry M Spring Green mixed with American Apparel Army Jacket and the purple flowers are Revlon Grape Fizz and O.P.I Gouda Gouda Two Shoes dotted on top of each other. Here's the inspiration image I found on Pinterest by Stephanie Ryan. I think I managed to match the colours well and I think they're really cute and nice to bring back summer as it's quickly turning to autumn here. Thank you Jessie for having me on your blog and hopefully you all enjoyed my design! These are cute! Love the inspiration for it.